This could be specifically a hornet or one of the wasp species (order Hymenoptera). Guessing from its behavior of looking after its nest, I assume this is a female. It’s found in the same waiting shed at the rear area of Admiralty Park. The nest is still there even after weeks have passed when we spotted this early this month. A friend told me it could be a paper wasp. 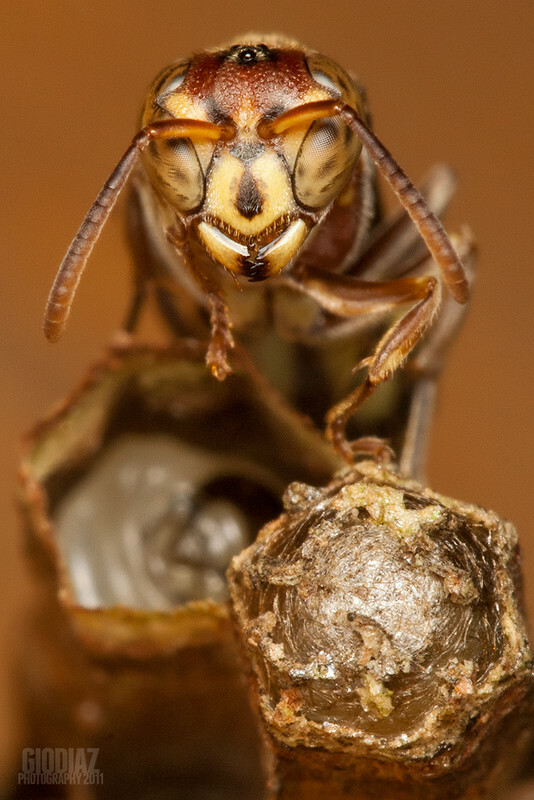 Hornets or wasps are insects having stingers and pairs of wings and can be solitary or social creatures. They have that characteristic ocelli or simple eyes on top of their heads and a pair of big compound eyes at the sides and a pair of long antennae. Oh, and somebody told me. If you squint and look closer in the back nest cell, there is a vague, blurry image of what looks like a man with Afro hair and moustache plus goatee. Weird. Image published by giovzaid85 on 2011-08-23 14:16:07 and used under Creative Commons license.